You may already be familiar with the different vitamins and minerals and what they do in the body. If not, the following is a simple guide to each of them and their benefits. Our body creates many of these; others we need to get from food. Find out the role of each one, the foods in which they are prevalent and what products by PURE you can get them from. Vitamin A – Needed for strong bones, good vision and healthy skin. It helps cell reproduction, stimulates immunity and is needed for the formation of some hormones. Vitamin A is found in animal sources such as eggs, meat, cheese, liver and cod. * Daily Build is an excellent source of vitamin A, with 130% of the Daily Value. Vitamin C – Helps make collagen and acts as an antioxidant. Good food sources include fruits, potatoes, broccoli, spinach and Brussels sprouts. GPS Adapt is an excellent source of vitamin C, with 130% of the Daily Value. Vitamin D – Works with calcium in helping build strong bones and teeth. It can be formed by direct sunlight on the skin. Good sources of food include milk, margarine, fatty fish and fortified cereals. Mila is an excellent source of vitamin D as are CalciuMK+ and Daily Build. Vitamin E – Helps protect red blood cells. Good sources of food include oils, wheat germ green vegetables and nuts. Get your daily dose of vitamin E form 360 Complete Shake, GPS Rebuild or Daily Build. Vitamin K – Activates proteins and calcium essential to blood clotting. Good sources of food include cabbage, liver, eggs, milk, spinach, kale and broccoli. CalciuMK+ is an excellent source of vitamin K.
Vitamin P – This is a flavonoid, or a byproduct of plant metabolism, so you get this when you eat plants. It enhances the use of vitamin C improving its absorption and protecting it from oxidation. Find this in fruit pulp, green peppers, broccoli and red wine. Calcium – Needed for bone and teeth formation. It is essential for making collagen. It is vital for healthy immune and nervous system. It also is used to synthesize fats and proteins. Vitamin D is needed to absorb calcium. * CalciuMK+ is an excellent source of calcium. Copper – Copper aids in the formation of red blood cells, promotes healthy tissues and helps support the immune system. Good food sources of copper include cashews, sunflower seeds, walnuts, cocoa beans and oysters. 360 Complete Shake, Daily Build and GPS Rebuild are all good sources of copper. Iodine – Helps set body temperature. You can get this from eating kale and seafood. Phosphorus – The body uses phosphorus for filtering waste and repairing tissue and cells. Mila and GPS Rebuild are excellent sources of phosphorus, with 120mg per serving. Potassium – Balances fluids in the body. Meat, milk, fruits, vegetables, grains and legumes contain potassium. 360 Complete Shake, GPS Rebuild, Alkaline Water Concentrate and Mila are good sources of potassium. Selenium – This is an important antioxidant which can be consumed from seafood and walnuts. 360 Complete Shake, Daily Build and GPS Rebuild are good sources of selenium. How well do your know your B6 vitamins? Knowledge is power and the more you know about vitamins, their benefits and their safe consumption, the wiser and healthier you’ll be. All eight of the B vitamins, the energy vitamins, are important in helping the body convert food into fuel. B vitamins also help fight infection and disease. It’s also important to note that excessive consumption can be unhealthy. In this blog post, we are going to educate on vitamin B6, also called pyridoxine. It plays a part in such major functions including movement, memory and blood flow. Vitamin B6 is a water-soluble vitamin meaning is dissolves in water so the body cannot store it. Leftovers leave the body through urine. Not enough vitamin B6 intake may be linked to depression, and can also cause anemia. A lack of vitamin B6 can cause confusion, nausea, susceptibility to infections and skin rashes. 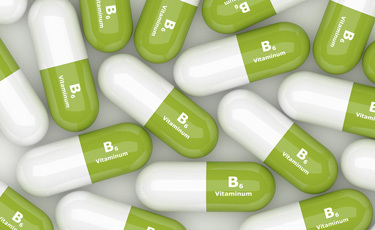 According to the federal government, you should not take more than 100 milligrams of vitamin B6 a day (the upper tolerable limit), in supplement form. However, high intakes of vitamin B6 from food is safe. GoYin, Daily Build, 360 Compete Shake, Metabolic ONE, GPS Rebuild, GPS Energize, GPS Hydrate, ENERGY and PURE Café all contain B vitamins, including B6. If you took the recommended servings of these products, which is 2 times a day, your vitamin B6 intake would be approximately 90 mg. However, if you were to take more than the suggested serving, approximately 3-4 times a day, you would be surpassing the safe limit. Following the recommended serving of every supplement is very important, as you want to be careful not to go significantly above the recommended allowance. Every product pack contains a Daily Usage Guide that offers suggested product use throughout the day for optimal benefits. Be sure to read the product labels or learn more about each product and its recommended use at livepure.com. Do you know your vitamin A, B, Cs? Vitamins perform what important function in the body? Calcium and __________ work together to give us healthy teeth and bones. This vitamin is found in CalciuMK+. 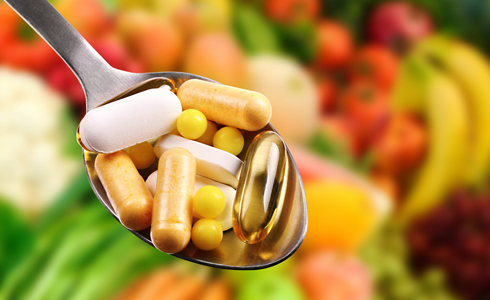 Our bodies need __________ essential vitamins. Mom wanted you to eat carrots because vitamin ____ is necessary for vision. 360 Complete Shake contains 50% of your daily recommended value. Vitamin C is required for the production of ________. GPS Circulate contains 250% of your daily recommended value. The word vitamin is a combination of what two words? This vitamin helps maintain and protect the sheath that surrounds nerve fibers. Folate works together with what vitamin to produce new red blood cells? GPS Hydrate contains 1000% of your daily recommended value of this vitamin. This vitamin maintains calcium levels by increasing its absorption. CalciuMK+ contains 150% of your recommended daily value of this vitamin. Which vitamin protects the skin? Daily Build is an excellent source of this vitamin. Calcium and vitamin D both help to maintain the health of our bones. What other vitamin do we need to keep our bones strong? This vitamin helps explain the name CalciuMK+. Which vitamins support your immune system? Immune6 is an excellent source of one of these vitamins. Symptoms often associated with aging may be caused by a deficiency of ___________. GoYin contains 200% of your daily recommended value of this vitamin. Riboflavin, niacin and thiamine are all members of what vitamin family? Which vitamin is the only one we don’t consume through eating or drinking? CalciuMK+ is an excellent source of this vitamin? If you answered 10 or above correctly, you are a health guru! Congratulations! If you answered 9-5 correctly, you are a nutrition novice. Keep studying. If you answered 4 or below correctly, return to start and try again.